A bubble show is interactive, inclusive and is suitable for all childrens parties (and adults too!). The bubble artist brings all the necessary equipment and also cleans up at the end of the session - which leaves everyone else to get on with the rest of party. Sounds good? It is, so read on for more about Bubble Performers. If you want to include an education element in the process - that's easy, for most bubble performers are happy to have a science section in their show, to reveal the secrets of making and shaping bubbles. Find a Bubble Performer for hire near you in minutes! Option 1. Enter your event location below & contact a Bubble Performer directly! Option 2. Request multiple quotes from available Bubble Performers Get Quotes! Option 3. Read information & advice on hiring Bubble Performers Read Advice! WANT TO KNOW MORE ABOUT BUBBLE PERFORMERS? Read on for the most comprehensive guide to booking a Bubble Performer, including how much a Bubble Performer costs, exactly what they will do at your event, plus tips, advice and information to help make your event one to remember! With a Bubble Performer, you will get a professional Bubble Artist who will dazzle children and adults alike with skilful Bubble trickery! What exactly will a Bubble Performer do at your event? A modern Bubble Artist (otherwise known as a Bubbleologist) will provide your crowd will a special type of entertainment in the form of bubble tricks that will include amazing feats such as: bubble sculptures, bubbles inside of bubbles, smoke inside of bubbles and tiny bubbles to gigantic bubbles! 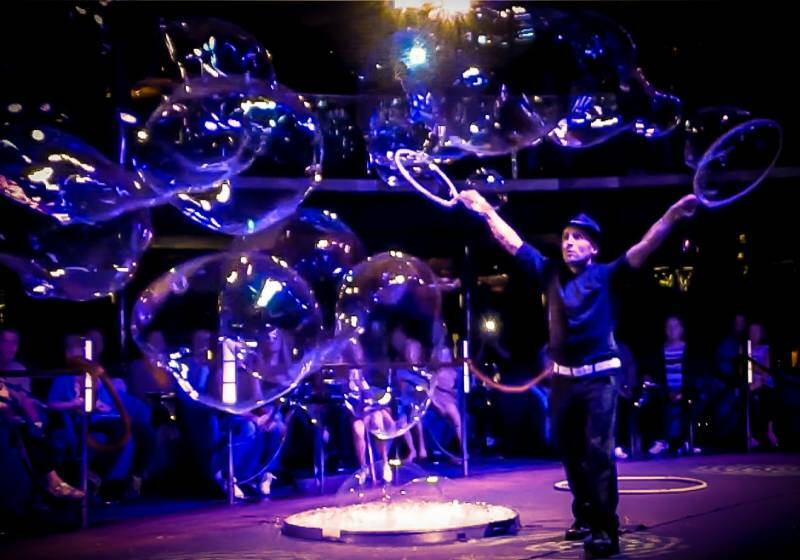 Mainly, a Bubble Performer will entertain your audience with a fantastic live show that will put the wow factor into celebrations and impress your guests, whatever their entertainment tastes may be. What event types are Bubble Performers hired for? If you are looking to hire entertainment for your wedding drinks reception then why not hire a Bubble Performer to thrill your audience?! The Bubble Artist can be set up anywhere at your wedding drinks reception venue to entertain children and adults alike as the bride and groom meet and greet their guests. The ideal way for a bit of light entertainment! If you wanted to hire an additional performer for your wedding evening entertainment, then we would highly recommend a Bubble Performer to shine at your wedding event! A Bubbleologist can be set up to entertain the children at your wedding whilst the main wedding entertainment is happening on stage! What a perfect way to ensure that the bride and groom get the attention they deserve on their big day! Hire a Bubble Performer for the entertainment at your corporate event! If you are hosting a work-do where children are also invited, then a Bubble Performer would be ideal to keep the children captivated! Alternatively, a contemporary Bubble Performer can put on a real show and wow a more mature audience with spectacular bubble sculptures that have to be seen to be believed! If you are organising a trade show or a product launch, then hire a Bubbleologist to entice your potential clients and public! A Bubble Performer will also be unique entertainment as a festival performer! They can perform inside or outside (weather permitting) so whilst bands are playing at a hot summers music festival, the Bubble Performer can be set up to entertain the festival attendees whilst they take a breather from the music! You might also want to consider hiring a Bubble Performer to teach you the basics of making Bubble shapes! This would be a perfect day out for a group of friends wanting to try something unique, and who knows, you may even decide to take it up for yourself! You could hire a Bubble Artist to be set up outside of your toy shop on a special offer day. You may be organising a 20% off day, well, by hiring a Bubble Performer to stand outside of your shop, you will get a professionally trained Bubble Master who will blow gigantic bubbles and link them up together with other bubbles which will entice a crowd in no time! Before you know it, you will have a gigantic cluster of bubbles that children and adults will find fascinating! Hire a Bubble Artist for your party entertainment and you will be blown away! A Bubble Performer will be naturally thrilling as children’s birthday party entertainment, but will also be an ice-breaker and a breathtaking showstopper at adults parties as well. 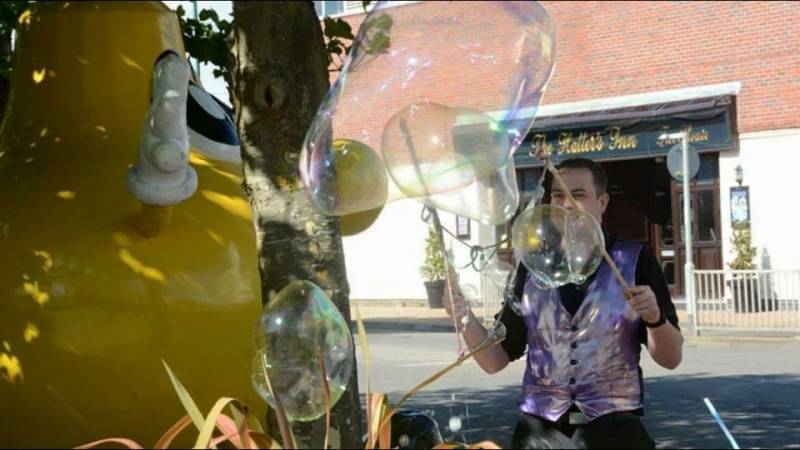 The Bubble Artist will be a seasoned entertainer and much like a Magician, will use crowd participation and comedy antics to entertain everybody at your event! Watch in owe as your Bubble Artist carves wondrous shapes out of bubbles, be it bubble snakes, a bubble Mickey Mouse and even bubble people! They will create the biggest bubble you have ever seen right in front of your very eyes and will baffle you with how they manipulate it without it bursting! Bubble shows will usually end with a daring bubble moment such as a person inside a bubble! Look on in awe as bubbles spin round and round at incredible speeds without bursting! This is ideal entertainment if you are hosting a circus themed party! Watching coloured smoke being poured into bubbles is a truly beautiful experience. The Bubble Performer will use great lighting effects and atmospheric music to turn the bubble show into something that you and your crowd will be talking about for long after! How much do Bubble Performers cost to hire? Our simple to use entertainment directory allows you to firstly search for the best Bubble Performers who are local (or travel to your area) and then via the contact form you may message them directly to enquire for a no obligation quote to perform at your event. Some acts will also add a rough price guide to their profile for your convenience. What are the usual set formats and performance lengths for Bubble Performers? A Bubble Performer can tailor their performance to times to suit you and your event, however, on average a professional Bubble Performer will perform for 60 minutes. How much space will a Bubble Performer need at your event? A Bubble Performer will need a certain amount of space to create their huge bubbles, so we recommend using our personal messaging service to enquire with the Bubble Performer how much space they will require. What equipment and set up requirements do Bubble Performers need? As with most artists who sign up to Entertainersworldwide.com, a Bubble Performer will provide all of their own equipment. You may want to enquire if an artist needs a PA to amplify their sound, in which case we would advise to use our easy to use messaging service to find out. We do ask that each performer gets a backstage area in which they can prepare for the performance ahead. If your venue does not have a backstage area, then we kindly ask that you enquire with the venue to seek an alternative space in which the performer can comfortably get ready to entertain. 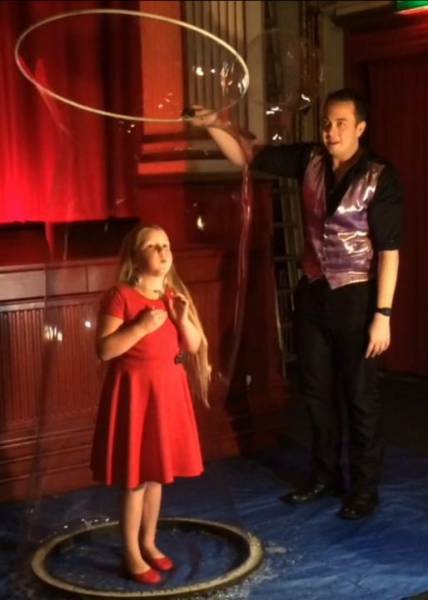 How can you find and book a Bubble Performer with Entertainersworldwide.com? WANT TO RECEIVE A RANGE OF QUOTES FROM Bubble Performers?